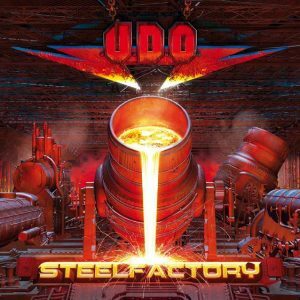 U.D.O., the German metal band led by former ACCEPT frontman Udo Dirkschneider, will release its new album, “Steelfactory”, on August 31 via AFM. The first single, “Rising High”, can be streamed below. Dirkschneider has spent the last two years touring under the DIRKSCHNEIDER banner, performing classic ACCEPT songs for the last time. The trek, which was originally supposed to conclude with the band’s North American run in January/February 2017, has now been extended through the fall of 2018. Guitarist Stefan Kaufmann recently rejoined U.D.O. for the group’s summer festival appearances. Kaufmann left U.D.O. in September 2012 for health reasons. He was the drummer for ACCEPT on nine albums but was forced to give up drumming towards the end of the band’s initial run after sustaining a serious injury to his back. Stefan joined U.D.O. as a guitar player in 1996, following ACCEPT‘s second breakup, and recorded nine albums with them, including his most recent release with the group, 2011’s “Rev-Raptor”.